To help children avoid too much passive screen time viewing, parents should track the amount of free time a child spends in front of a screen and set limits to encourage their child to engage in other activities. 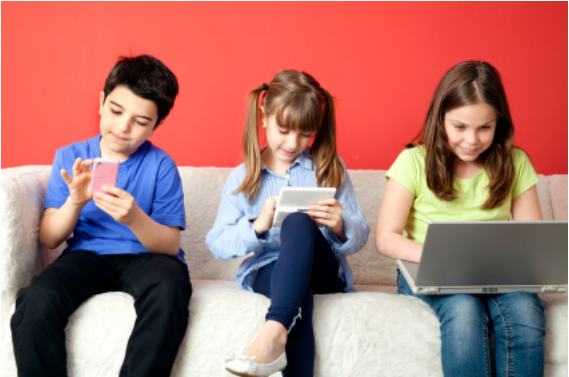 Screen time refers to the use of tablets, smartphones, laptops, gaming consoles, desktop computers, and good-old-fashion television. Parents are also encouraged to set an example by limiting their own passive screen use. Together, children and parents can turn off their screens and together play a board game, take a walk, or enjoy some time at a park. Helpful tips to help parents manage their child’s screen time:Talk to the child’s teacher to understand the amount of classroom time devoted to iPads and computers each day as beneficial interactive educational tools. Parents can then set a time limit at home that balances well with their screen time at school. The rule is simple: when time is up, turn off the screens and begin another activity. The Time Lock app ($0.99 in the iTunes App Store) allows parents to set a time limit for iPad, iPod, or iPhone use. Once the time limit has been reached, the device will lock and require a parent pass code to unlock it. Similar apps are available for Android devices. For children under the age of five, it is recommended that recreational screen time at home not exceed two hours per day. For children five and older, passive screen viewing on a daily basis should be limited to four hours per day. Introduce the principles of time management and add variety to a child’s day. By limiting screen time, parents can encourage their children to engage in a mix of creative and physical activities each day. For example, when the time comes to switch off the game console, encourage children to get their bodies moving by engaging in outdoor physical activities such as riding a skateboard or playing basketball. Activities such as reading a book, drawing a picture, and figuring out a puzzle help exercise the brain. Encourage children to use their screen time to engage in interactive games that promote critical thinking. Some great puzzle games that develop problem solving and critical thinking skills include World of Goo ($2.99), Dwelp ($1.99), Magnetized ($2.99), and Luminosity (Free, with in-app purchases). A few subject-specific apps that offer interactive features include Flags Fun (Free) and Art by Puzzle World Games ($0.99). By managing screen time, parents will help children appreciate the benefits of a well-balanced day of activities that foster healthy academic, personal, and physical enrichment. Labels: Anaheim, ca, Fairmont Private Schools, Friday Folder, Kindergarten, orange, Orange County, parenting, private school.